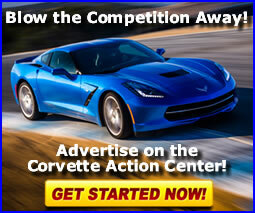 Practical Car Care for Corvette Owners: Microfiber--What's Up with That? 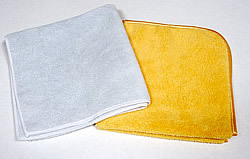 Microfiber towels. Seems like anyone with a passing interest in car care talks about them. What's up with that? Microfiber or "split" microfiber, as it is sometimes called, consists of extremely fine strands of polyamide (better known by DuPont's trade name, "Nylon") and polyester. Each has a specific cross section--polyamide is wedge-shaped and polyester is star-shaped--and are combined, concentrically, to form a single thread. 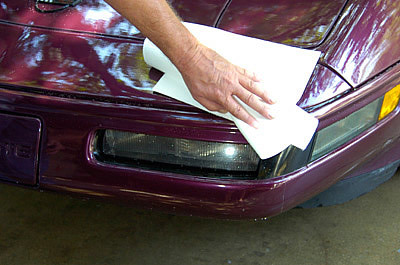 Microfiber towels appropriate for automotive use have a mix of 20-30% nylon and 70-80% polyester. In the United States, the unit of measure for the linear mass density of fibers is "denier". The standard length is 9000-meters and if that length weighs one gram, then the fiber has a denier of one. 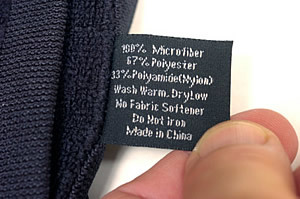 By definition, microfiber's denier is less than one (diameter of about 10 micrometers or .0004-in.) and "ultra fine" microfiber has a denier of 0.2 or less. Want to skip all that technical mumbo-jumbo? Just remember that a microfiber is freakin' tiny--around 100 times more thin than a human hair. The wedge-shaped segments penetrate of grease and oil, scoop-up the grime, pull it into the voids of its internal structure and hold it there until the towel is washed. Conversely, the rounded fibers of ordinary cotton may capture a small percentage of the dirt, but mostly push it along the surface. From a car care perspective, it's cotton's pushing dirt around and microfiber's sucking it up which is the key difference between the two and why cotton towels can scratch a car's finish but microfiber seldom does. Here is a microfiber thread shot through a microscope. 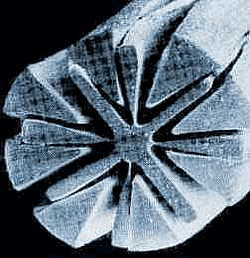 The star-shaped structure is the polyester core. The polyamide wedges are attached between the polyester spokes. The wedges pick-up dirt, movement of the two fibers traps the dirt between the spokes and the wedges. Additionally, the polyester spokes wick moisture. This image, shot through a microscope shows a freshly-painted surface which has been polished with a cotton terry-cloth towel. 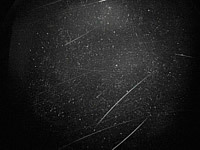 There are tons of scratches. This microscope shot shows a similar surface after polishing with a microfiber towel. There are a few scratches, but far less than the surface polished with cotton. Microfiber has two chemically-related properties which compliment each other. Polyester is "oleophilic", meaning it has an affinity for oil and polyamide is hydrophilic, meaning it has affinity for water. Microfiber's chemical attraction for oil and water works in partnership with its mechanical ability to trap and hold dirt such that grime is removed leaving a clean, streak-free surface. Microfiber's third key trait is that, when woven, it has 40 times greater surface area than other materials. Due to the large area and the capillary action of the fine threads; microfiber cloth has significantly greater absorption. In fact, it can absorb about seven times its weight in fluids, far more than cotton. Manufacturing of microfiber towels seems to leave the corners of some of them with hard "nubs"--sort of like the ends of nylon rope which are melted to prevent fraying. These nubs will scratch your clear coat or paint. When we buy a new bunch of towels, regardless of source, we slide our finger tips over the corners of each one, feeling for nubs. 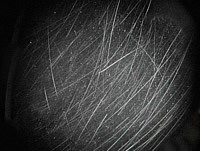 If we find them, we use a small, sharp knife or small, sharp scissors or even fingernail clippers to cut the nubs away. We evaluated microfiber towels from several vendors. The best standard-sized (16x16-in) general-purpose microfiber towels we tried came from C-Magic (3-pack, PN DA404). California Car Duster Company also has 16x16 microfibers (3-pack, PN 22104). They're not quite as heavy, so their ability to hold moisture might not be quite the same, but they are still a good choice and carry a lower price. California Car Duster, also, has a "Clean and Polish Plush Towel" (PN 22200), high-end item designed specifically for finish polishing. It's heavy-weight material, larger (16x24-in.) and has two separate textures, a woven side, for waxing and cleaning, and a sheared side, for finish polishing. The Plush Towel is a bit more expensive, but provides outstanding results and was the best product we tested in the final polish role. We tried 16x16 G.P. 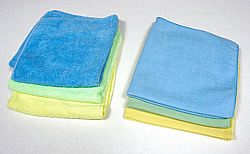 microfiber towels from the Eastwood Company, (3-pack, PN 52210) which performed well. Lastly, Grit Guard has a general-purpose microfiber (PN 461-P) which we found does a good job, too. Lastly, a little on microfiber maintenance. When cared-for properly, microfiber towels are very durable. They can be washed 100s of times and maintain their effectiveness. You can machine or hand wash them. Wash microfiber in cold or warm water, but never hot water. Use liquid rather than powdered laundry detergent. Never use fabric softener. You can put them in the drier on delicate cycle, but it's better to line-dry them.